(Tyto alba) If you are looking for a barn owl, listen for their eerie, raspy calls, quite unlike the hoots of other owls. What does the barn owl eat? Barn Owls eat mostly small mammals, particularly rats, mice, voles, lemmings, and other rodents; also shrews, bats, and rabbits. Most of the prey they eat are active at night, so squirrels and chipmunks are relatively safe from Barn Owls. About 14 years in captivity and 3 years in the wild. How many barn owls can be born at a time? Barn Owls do not make nests, they simply find suitable sites to lay eggs. The female usually lays 3 to 6 eggs, but can lay up to 12. Barn Owls live in open habitats across most of the lower 48 United States and extend into a few parts of southern Canada (as well as in much of the rest of the world). Barn Owls swallow their prey whole—skin, bones, and all. About twice a day, they cough up pellets instead of passing all that material through their digestive tracts. The pellets make a great record of what the owls have eaten, and scientists study them to learn more about the owls and the ecosystems they live in. Barn Owl females are somewhat showier than males. She has a more reddish and more heavily spotted chest. The spots may indicate the quality of the female. Heavily spotted females get fewer parasitic flies and may be more resistant to parasites and diseases. The spots may also stimulate the male to help more at the nest. The Barn Owl has excellent low-light vision, and can easily find prey at night by sight. But its ability to locate prey by sound alone is the best of any animal that has ever been tested. It can catch mice in complete darkness in the lab, or hidden by vegetation or snow out in the real world. 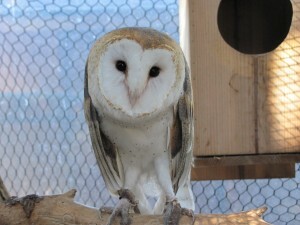 The oldest known North American Barn Owl lived in Ohio and was at least 15 years, 5 months old. Barn Owls are usually monogamous and mate for life, although there are some reports of males with more than one mate. You can find them by listening for their eerie, raspy calls, quite unlike the hoots of other owls. Nono – came to us in 2007 with an injured wing. Screamer – and his nest mate were left outside our gate anonymously by someone who had them as pets. Screamer was imprinted, but his nest mate was not, so we were able to release her.